Forgandenny Bed & Breakfast is a magnificent heritage listed Federation home. (Circa 1900). Commissioned by Dr Charles Edward Lester, (the first Surgeon to practice in Mudgee), Forgandenny House was designed by Harrold Hardwick, and built by master craftsmen, Collier & Carmichael, and served as the Doctors residence and surgical practice for 97 years, before being reborn into serving the tourism industry as one of the finest Bed & Breakfast accommodation Mudgee has to offer. Located only 250m from the town centre, and overlooking Lawson Park, and Cudgegong River, the scene is set for our guests relaxation and enjoyment. 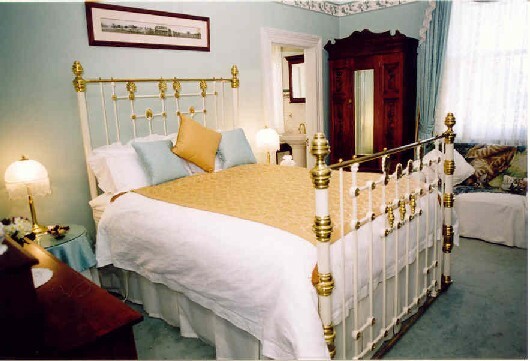 Forgandenny House B&B offers 3 elegantly appionted Queen size rooms, each with ensuite. A cosy warm log fire in the guest lounge area, provides an atmosphere of a bygone era, that you can only find by staying at Forgandenny House B&B Mudgee. We look forward to welcoming you! FACILITIES: Forgandenny House B&B features a Tennis court for guests enjoyment. NEARBY ATTRACTIONS: Over 40 wineries and friendly Cellar door tastings, that showcase the range of variety that the Mudgee Valley can offer in award winning wines. The nearby town of Gulgong, and home to poet Henry Lawson. The Historic town of Hill End, discover the early days of Gold mining in the area. The town of Mudgee, full of life, character and charm of historic heritage buildings and homes of the early 1800’s, that blend beautifully with the cosmopolitan lifestyle of alfresco cafe’s and dinning. You will Love Mudgee for so much it has to offer. Come visit us, you won’t be sorry! TERMS: Credit card guarantee required at time of booking confirmation. Cancellation penalties apply. Please view conditions on forgandenny.com.au website. PAYMENT OPTIONS: Visa, Mastercard, Cash.